Provincializing Europe: Postcolonial Thought and Historical Difference is about recognising the limitations of Western social science in explaining the historical experiences of political modernity in South Asia. Chakhrabarty offers a critique of the Enlightenment concepts of a universal human experience and of secular modernity. However, his project is not about rejecting European thought as a whole but rather, an effort to renew European thought “from and for the margins” (16), where the diverse histories of human being and belonging can have a place for themselves. In other words, the idea of Provincializing Europe represents Chakrabarty’s attempt to pluralise the history of global political modernity. Provincializing Europe is set in the intersection between subaltern studies and postcolonial theory. In alignment with postcolonial theory, Chakrabarty offers a critique of historicism both as philosophical thought and a conceptual category. He sees postcolonial thought as a practice of critically “engaging the universals—such as the abstract figure of the human or that of Reason—that were forged in eighteenth century Europe and that underlie the human sciences” (5). In other words, Chakrabarty locates a problem in Enlightenment philosophy for assuming the human as an abstract figure. Postcolonial thought, as Chakrabarty suggests, is invested in understanding the different conditions of being, which, in a way, allows one to recognize the diversity of human experiences. 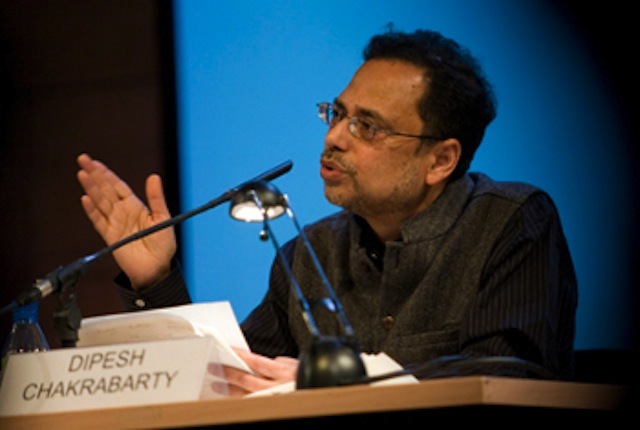 It is this recognition of diversity that compels Chakrabarty to describe the visions and experiences of political modernity in India as different from Europe. This recognition of historical difference allows him to further question historicism as an idea that suggests that, to “understand anything it has to be seen both as a unity and in its historical development” (6). Chakrabarty therefore, chooses to displace the temporal structure that historicism as a mode of thinking represents. He argues that historicism represents a stagist theory of development wherein modernity, capitalism and civilisation appears in a “first in Europe and then elsewhere” temporal frame. As Chakrabarty problematises this linear temporal frame he proposes an alternative reading of the processes of global political modernity by engaging with its antinomies. Furthermore, Provincializing Europe rejects the idea of a universal history of the globalisation of capital by examining the multiple constitutive elements of that history. This move enables Chakrabarty to interrogate Karl Marx’s conceptual category, “abstract labour.” Similar to his critique of historicism, Chakrabarty rejects the temporal totality of history. As opposed to Marx’s universal history of capital, Chakrabarty conceptualises two histories of capital: “histories posited by capital” as History 1 and the histories that exist outside of “capital’s life process” as History 2. Chakrabarty considers History 1 as purely analytical whereas History 2 beckons him “to more effective narratives of human belonging” (71) In other words, Chakrabarty calls for an exploration of the “politics of human diversity” and argues that various History 2s continuously modify History 1. The remarkable achievement of Chakrabarty’s conceptualisation of History 2 lies in his ability to create room for incorporating the history of human subjective experiences into the history of capital and vice-versa. To put it differently, Chakrabarty shows a way toward a sensitive reading of the subject while we grapple with the diverse histories of capital’s life processes. Provincializing Europe also reflects on the problem of conceiving history as a secular subject. Chakrabarty considers secular histories inadequate when it comes to explaining the postcolonial conditions of being. In the particular case of India, there lies a difficulty in conceptualising political modernity as “the seemingly nonmodern, rural, nonsecular relationships and life practices” constantly influence the modern institutions of government (11). Since the task of conceptualising the present in the postcolonial context is laden with such anachronisms, Chakrabarty seeks to develop a conceptual framework that take into account other forms of the past, other histories that capital encountered as its antecedents. Chakrabarty’s desire for the inclusion of the other forms of past makes his critique of secular histories powerful. In other words, the idea of Provincializing Europe matters for its reincarnation of the other forms of the past; pasts that constitute the postcolonial conditions of being and belonging.